Effective ridicule employs two elements: caricature and belittlement. Taken separately, these are wounding; taken together, they have enormous force. They strip their target of all characteristics but one, and reduce that one to risibility. Any other trait the target possesses is completely effaced. But what’s truly deadly about effective ridicule is that the user enjoys it. He gets positive psychic feedback from it. That makes it self-reinforcing and self-perpetuating. Worse yet, the target’s attempts to shut it down make him look like a killjoy. 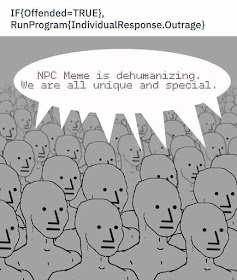 Note how beautifully the NPC meme, one of the easiest to apply that I’ve seen in political combat, fits the above patterns. Note also that the Left’s attempts to ridicule President Trump have fallen flat, in part because he ignores them and in part because of his own gift for ridicule. This one will be with us for a long time. Let’s torment the Left and enjoy the hell out of it. PJW does a fine job of employing your recommendation -- hitting back at radicals with Alinsky rule #5. 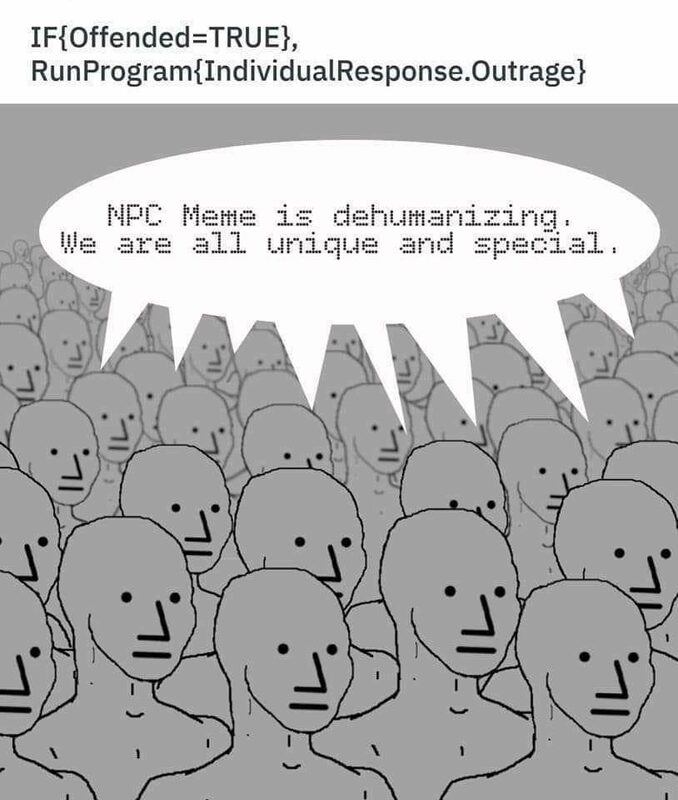 Until I saw that a couple of days ago, I had not heard of NPC before. I often find PJW a bit too harsh to listen to, but this time he really made me laugh. Wasn't that one of Alinsky's Rules? Comments are moderated. I am entirely arbitrary about what I allow to appear here. Toss me a bomb and I might just toss it back with interest. You have been warned.